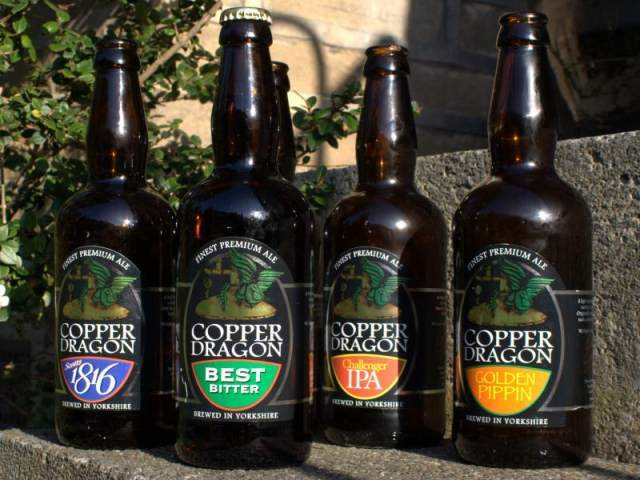 The Copper Dragon Brewery resurrected the local brewing industry in Skipton in 2002, with the aim of re-establishing the long defunct Skipton Brewery. Their aim, after much research which basically indicated that the more artisan end of the beer market was being squeezed to near death by the big multinational breweries, was to brew traditional, high quality beer. Copper Dragon have five beers in production. Golden Pippin is a light blonde with a citrus tang and a huge nod to the Continent that I’ve found goes extremely well with Indian food, whilst right at the other end of the spectrum, Black Gold is a rich, satisfying dark brew, full of body and roasted malts, the recipe rescued from old, long-forgotten brewery records. Both are quite superb. Best Bitter is apparently brewed to ‘satisfy the Northern pallette’, which I can confirm it does. Challenger IPA is a light, well-balanced and full-bodied and Scott’s 1816 is a heavyweight, serious bitter. Both are full of hops. Of the five, my favourites are Golden Pippin and Black Gold. The brewery have just announced a solid set of financial results, turning over more than £4million from the sale of over 500,000 pints and 25,000 bottles. Actually, ‘solid’ might be something of an understatement. More importantly, they’ve increased their workforce by fifty percent – creating jobs in the middle of a recession is most definitely indicative of a thriving business. I called in at the Copper Dragon Brewery with the sole aim of picking up some bottles to try, and didn’t have a chance to take the brewery tour – that’s for another visit – but the new Visitor’s Centre looks very smart, complete with a bistro that I’ll certainly try soon. Unsurprisingly, the bistro has all five beers on tap and uses Golden Pippin in the batter for their fish. In a stroke of what I consider to be utter genius, they also serve breakfast. For closer look at the brewery’s astoundingly shiny new plant, have a look at this post and this post from The Good Stuff. Copper Dragon is a roaring success, and I think this is down to one thing and one thing only – their beer is just excellent. The range is carefully thought out, the beers are crafted with skill and precision, and have a freshness and vigour about them. This sounds great, I've got to go for a visit. Great review. Neither my husband nor I can turn down a good micro-brewed beer, so we would be very interested in trying this. Maybe I missed this in your post, but where is Skipton? Nice Review. I might have to order some. My husband LOVES LOVES IPA!!! sounds like a great place to visit, thank you for the honest review! hey – thanks for the linkage. I do have a healthy respect for CD, not just because thier beers are so solid, but because they do taste good. Simple, honest beer. Peter Taylor, thier MD, is also one of the nicest men i have met in beer, and he also founded Northern Homebrewers, so is somewhat of a founding father in that respect. my only gripe -and its a small one – is I wish they would do another couple of beers. Personally, I like the Challenger IPA the best. Miranda -in that case, Coppe Dragon is made for your husband. Chickenless Chick – I know, it's tempting – working in a brewery? Speechless. Leigh – You're right, it's good, solid beer. I agree that they ould broaden the range a little – the odd guest or seasonal brew every now and again would be great, but then again, I admire them for sticking to a small range and turning it out consistently well. Skipton, just down the road from me! I too love those micro brewed beers!